Being able to look unique. Whether through special event items or rare drops from elite monsters. 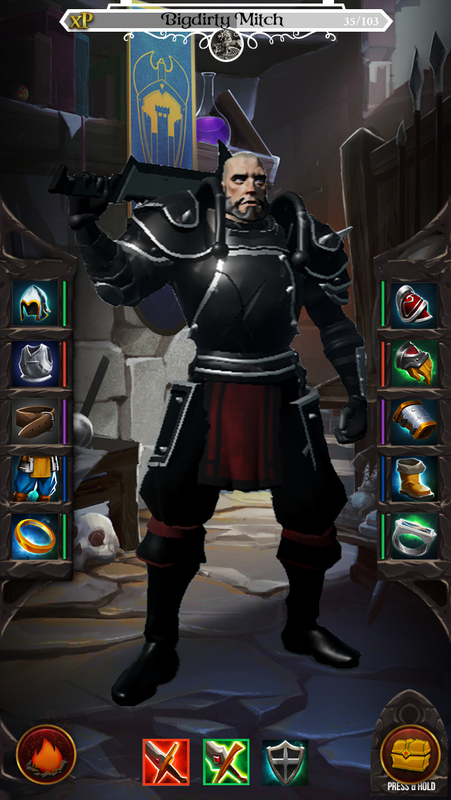 Before I ask, do all weapon/gear look the same or does equipping modify your appearance? if it does, then looking 'unique' can be accomplished via forge and alchemy by creating special color and design items that when forged into an item could, for example, invert it's colors, change a blade to be blue or, create a tiger stripe pattern amidst the equipment. On another note for development, @TheWizard , what do you think of the idea of quests that let players create a skill, limited to one but, giving a player a signature skill based on amount of times quest X is completed = more points to invest in said skill. And when a skill is made and named, the name can be Unique locked so others won't have it. As we begin, @xeru, the gear will be the primary way you customize your appearance. There will be lots of loot and lots of ways to look interesting. Special alterations or transmog is stuff we're planning for, but probably won't be featured right away. Part of what we're experimenting with is how much information you get about your opponent simply by seeing what he/she is loaded out with. On your second point, I like that idea. We're still building out the 3 Class system (eventually 6) with 3 specialities per Class that lets you make a gazillion builds, so signature skills isn't in there yet, but I like the way you think! I agree, too, with finding as many ways as we can to give players the ability to name things and make them their own (thus this thread). Keep it coming! lore/background number1 but with good character development so can control your destiny with non-lineer playground. Haha, I would. But alas, this is just for perspective. We'll have all of it, though not all in the ways you might expect. That's awesome, so @TheWizard there will be things to accomplish that will require multiple members of the community to do together? Like world event kind of things? That as me more pumped then anything to hear details about. Yes, that's right-- the combat system is designed as a 1-on-1, as you've seen, but there will be Boss Battles and World Events where you band together and take shots at something you can't possibly beat on your own. In addition, you have the Houses systems, which will have interesting options for cooperative accomplishing of tasks. Development of your character is very important in a rpg. I don't like it when every wizard is built the same way, because someone figured out the perfect way. I like it when there's no perfect characters. Everyone is very different and play very different ways. Jack of all trades and experts of a certain skill. While the above makes it seem like characters will all end up having the same look/feel eventually, I think character development could still be made via story/unique choices that let us tell our own story, and that is important, I think. Let us make the character's our own, through skill/gear selection as well as story moments. Ah yes, agree, Drak. One of the things we're going after is the whole many-builds-achieve victory angle, so you'll have to keep us honest there. Right now (these are rough numbers), the total number of Talent Points you can allocate to your character is 50. And you have about 130 choices per Class-- so you can't possibly choose everything and max it. On top of that, we do in fact have a strength weakness system in the form of Martial/Magic/Mystic abilities and damage. And gear plus resistances will help out with that. Sounds great, Wiz. I'm looking forward to seeing what the classes and choices look like . I do have one question, have you guys looked at the skills to see if any of them scream "well duh I'm gonna take that one" and if so, have you thought about why that is a skill and if it could be integrated somewhere else, since everyone is gonna take it? I realized while switching skills out in D3 that pretty much all of the skills are viable (up to a certain difficulty level, it seems) and mainly serve to help a player taylor their build to their play style, instead of "You must take Active skills X and Y, with passive Z in order to have a build worth a crap"
Yes, that's one we're staying on top of. And indeed, a few have risen to the top already and we're asking ourselves that very question. Between actives and passives and gear, there are emerging builds that "work" but that's all part of the process. We've failed if there aren't many viable builds, and guess who's gonna tell me that? I like the new ideas. I've always been a fan of table top d&d. Every game you meet someone that had a different but effective way to complete a quest. Free range of background stories and skills. Have to say character development. Everything else comes secondary to having the most epic character. Interesting that character development was the majority vote. Im thinking that's because if everything else is implemented well, than you don't notice them as much and character development flows naturally. Actions should have consequences and that in turn spurs growth. Grinding mobs to level up (PvE) what impact does this have on the environment? That's a pretty big question and feels like a daunting system to code but —and I say this having no coding experience — maybe it could be something as simple as kill x amount of Mob 1,trigger more spawning of Mob 7 because Mob 1 was keeping Mob 7's population down. Or kill x amount of Mob 9 and this triggers a quest where a village is now being attacked by what's left of Mob 9 and you have to defend the village (think rogue elephants rampaging villages in India due to poaching and creating angry bulls). Actually, @Monkeric, you're hitting on some of the things we're experimenting with in PVE-- you will definitely be able to grind, but the Quests you choose to take (which will involve dueling NPCs for the most part in this game), the CYOA choices you make (choose your own adventure) and how you do in your House will move things like Motivations and Factions around and we hope to have a satisfying system where you feel like you're having an affect on the game world. It's a mix of them all but character development. Controlled PvP i.e. when I want to challenge or fight others. Not Open PvP where you can get killed even when walking around on the streets. Character balanced is very important to me personally. Not some imbalanced game when one class or race dominate all the time. Grinding is better than paying for power - IMHO. Wish I could vote for more in this poll or rank them. I think character development is a huge part but I chose PvE because too many games are relying heavily on PvP and the PvE aspect is forgotten or is a sliver of what you do in game. A lot of games are even giving options to Auto through some PvE modes.